UPDATES 5-22-10: John Amos, President and founder of SkyTruth, today co-authored an excellent New York Times Op Ed piece on the vitally important measurement of the Deepwater Horizon spill. It’s a must-read for everyone and John is already scheduled for this coming Monday’s show. 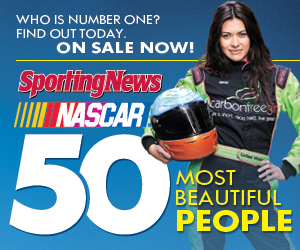 And, NASCAR driver and activist Leilani Münter will also now be joining us on that same 5-24-10 broadcast of Blue Planet Almanac radio. Leilani visited with us on a show last year. I’d said in my weekly environmental newscasts at HealthyLife.net that I’d be postponing the difficult news of the Spring 2010 Deepwater Horizon rig oil spill. It’s all over the news, you’ve seen lots about it, and careful time needs to be devoted to its coverage. Although its effects will be felt and remembered for decades, some of us with 30 years’ perspective have seen this kind of thing before. This isn’t our first rodeo. 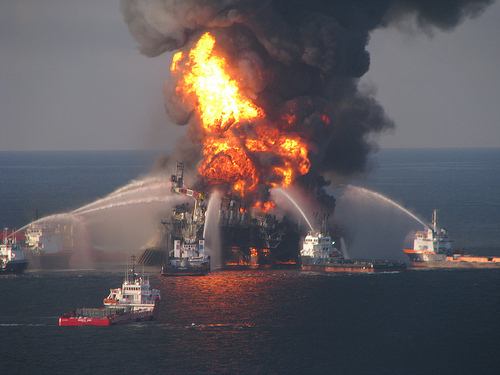 But now’s the time, so this coming Monday, May 24th, 2010, at 8 AM Pacific, we’ll be talking about the Deepwater Horizon spill and the Gulf of Mexico, live on HealthyLife.net. If this story could be said to be about the preservation of precious lives and life, then this accident isn’t just an environmental disaster. It’s important to remember that people lost their lives over this. The Washington Post was one of the few outlets which has good stories about this – please see, “Families of oil rig victims struggle with a devastating loss.” The platform workers’ families and destinies are changed irrevocably, and we should all reflect on the pain this has caused them, keeping them in our thoughts. BP made many big mistakes culminating in negligence (my word) which killed 11 people and began a massive environmental disaster. Not only just hours before the event, but for months beforehand the blowout preventer’s maintenance was ignored. Why would this culture of irresponsibility be allowed to flourish? No one in the Obama administration is forthcoming about how much oil is spilling. The National Oceanic and Atmospheric Administration has consistently minimized estimates of its scope. Everyone at BP is feeding us half-truths. Many sensible people believe the spill is far larger than we’re led to believe. Where’s the oil actually going? What’s it doing? Should we accept these things as “business as usual?” Why would anyone in their right mind accept what a company with a poor environmental record tell them about a massive, life-changing mistake, without having every fact they mumbled be triple-checked? Where there’s smoke, there’s fire. If a company inadvertently kills 11 and catalyzes a massive, fatal, environmental and economic disaster, wouldn’t that qualify in most sensible peoples’ minds as a candidate event for criminal indictments? For me, these things barely scratch the surface of a problem that’s been brewing for decades. But to start to answer them, we’ve got to trust people who make it their business to give us the right information about the Earth, who don’t have a massive investment in environmentally destructive practices. And unfortunately that won’t include American government. So we’ll be talking with John Amos, Executive Director of SkyTruth.org, David Guggenheim, President and founder of 1Planet1Ocean.org, and environmental activist and NASCAR & IndyCar racer Leilani Münter. Münter is an ambassador with the National Wildlife Federation, which bills itself as America’s largest conservation organization and strives to inspire Americans to protect wildlife for our childrens’ future. John will discuss his organization’s estimates about the scale of the spill. His nonprofit specializes in showing people what’s really going on based on careful analysis of satellite imagery. Sounds sensible, right? Take a look at the example satellite image in this post, taken from SkyTruth’s Website. 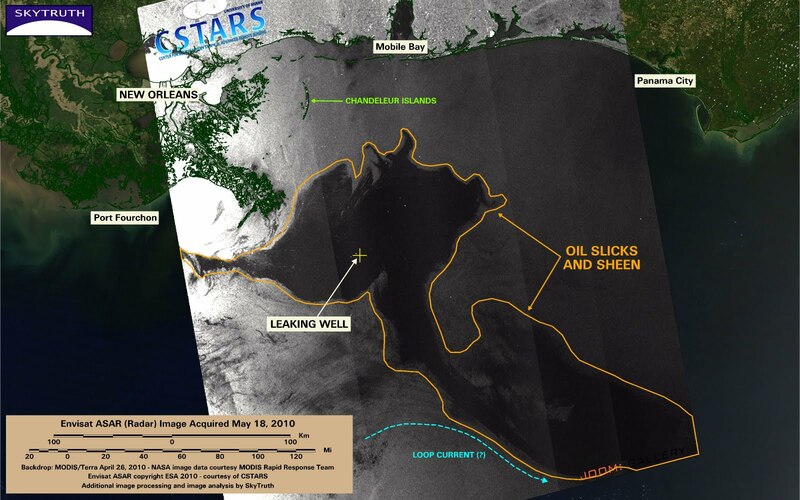 SkyTruth Gulf Oil Spill satellite snapshot, 5-18-10. Click to enlarge. David E. Guggenheim, who has been Blue Planet Almanac’s distinguished guest before, will explain the downstream effects of a spill this size from an ecologist’s perspective. 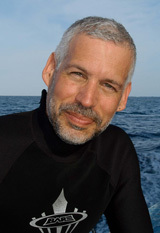 David has a long history as a marine biologist, including – guess where – the Gulf of Mexico. And remember the word “ecologist” means someone with formal training in biology, chemistry, physics and natural history. David is especially knowledgeable about the science and natural history of the Gulf. When he agreed to take a few minutes to talk with us again, he mentioned he’s working with legend Sylvia Earle to prepare her testimony before Congress about the spill. Think of Leilani Münter’s role as an example for Americans because she lives many things middle America respects and admires. But she is also a trained biologist and environmental activist. And let the first one of us who’s without environmental sin cast the first stone, because Leilani has the respect, ears and attention of millions of NASCAR and IndyCar fans. Leilani’s Website, Carbon Free Girl, has hundreds of examples of her activities. worked as a stunt and photo double for Catherine Zeta-Jones, and has an IMDB entry. Blue Planet Almanac radio airs live with host Mike Austin on HealthyLife.net on the 4th Monday of each month at 8:00 A.M. Pacific Time. Blue Planet Almanac is also re-broadcast later in the week and shows are archived three days after airtime at that same site, with some available through this link. HealthyLife.net is an all-positive talk station and has over 3 million listeners monthly in 104 countries and all 50 United States. Blue Planet Almanac offers thoughtful perspectives on conscious, green living on Earth. With fascinating interviews, breaking news and product reviews, caller participation about Lifestyles of Health and Sustainability are encouraged, including science and policy of importance to Earthlings. Listeners can have their say in an environment that matters or simply listen to leaders in their field. Join us!